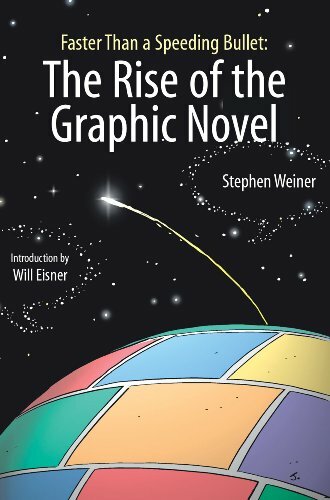 In Faster Than a Speeding Bullet, Stephen Weiner provides a short history of graphic novels, from the start of comic books up to recent works such as Chris Ware's Jimmy Corrigan and Dan Clowes' Ghost World. The book is just 64 pages, and many of them are illustrated with panels from comics and graphic novels, so it is light on text. Each of the 14 chapters is just a few pages long, Weiner says that the first modern graphic novel was Will Eisner's A Contract With God and Other Tenement Stories. He identifies Jules Feifer's Tantrum as a successor. The work of Frank Miller on Daredevil and Alan Moore on Swamp Thing were also important to the form, deepening it and giving it more drama. But it is Art Spiegelman's 1986 work Maus that Weiner sees as dramatically changing the field and making the graphic novel an artistic form that needed to be taken seriously. Wiener also describes Neil Gaiman's Sandman as influential. Jeff Smith's Bone is given a chapter to itself, which might surprise some readers, but Weiner makes the case that it merits such honor. Another work that may be unfamiliar to many readers is Scott McCloud's Understanding Comics, which is a self-referential graphic novel about the genre. Weiner does not engage in any profound literary analysis or make an effort to explain the artistic value or psychological depth of graphic novels. He pays more attention to the different publishers and the awards that books have won. The book will probably contain some information that is new to even devoted graphic novel fans, and it also probably leaves out works that devotees will believe important to the history of the genre. Nevertheless, this is a useful introduction that will be especially interesting for those who have read one or two graphic novels and want to know more.